Unlike many other Asian countries, Laos is underpopulated. People in Laos are divided according to language, location and culture. 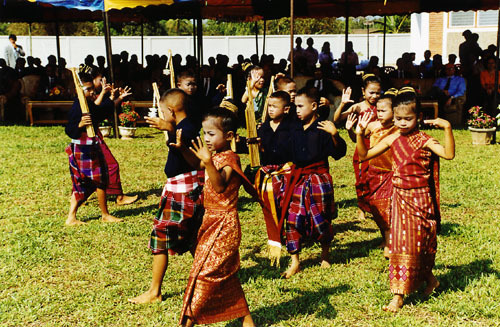 There are four types of people in Laos, namely the Lao Lum, or those who live in the lowlands; the Lao Tie, or those who are scattered throughout Laos but mostly live in the upland areas; the Lao Theung, which includes many groups of people including the descendants of the earliest people to inhabit Laos; and the Lao Soung, or a group who has been believed to be from Southern China since the 18th century. People in Laos are generally humble, polite and cheerful. They take joy in simple things and a simple life. They are hardworking, diligent and hospitable, especially to tourists. They are genuinely concerned about their daily living, such as farming. Many Laotians are migrating because of the lack of employment and slow developments, although the majority is contented with their peaceful lives in Laos. 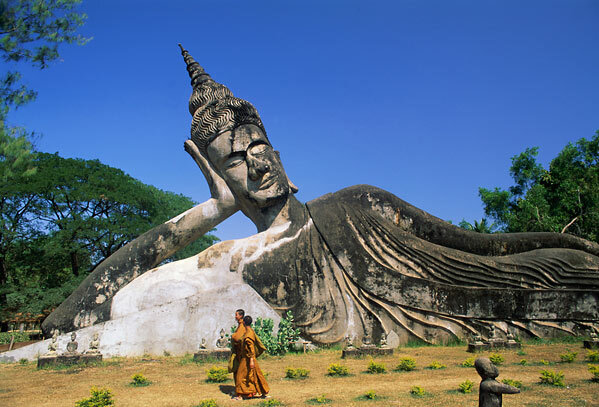 Considered an undiscovered haven, Laos is one of the most beautiful countries in Southeast Asia. Laos is known as the “Land of a Million Elephants,” and it is also known largely because of its forested landscapes. This ancient country was under the rule of Thailand during most of the 19th century, but it eventually became a communist country. Although considered poor, Laos has shown high potential in the timber and mining industries. It is also rich in natural resources, and during the last few decades, its economy has significantly progressed. Although Laos has been dependent on its neighbors, it is making its way to independence as infrastructures are developed, establishments are built, and people do their best to cope with the rapidly changing technology. For the past years, developments have been underway such as paving roadways, working on communication access points to provide easier communication from major urban areas to rural areas, and working on transportation. Laos covers 236,800 square meters of land that is surrounded by China, Thailand, Cambodia, Vietnam and Myanmar. Its land areas are mountainous and its climate is tropical. 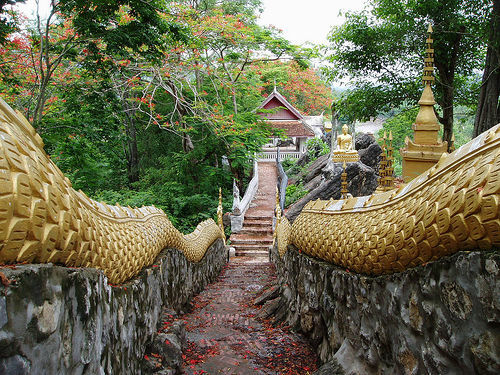 Laos experiences a rainy season from May to November and hot weather from December to April. Because of it forested lands, it has low agricultural potentials. Mekong River constitutes its western border. Mining is its strongest aspect; in fact, the country is rich in gold, tin, timber and other gemstones. People of Laos were originally from the Southern part of China, but during the 12th century, they moved into the country, settling and inhabiting the place. The early descendants of Laos were dark-skinned Malay-Indonesians. In 1953, Communist Vietnamese invaded Laos with the aim of taking over the land. The next year, it was agreed upon in the Geneva Conference that the invasion be stopped. The United States helped and supplied much aid to stop the communist take-over. In 1997, Laos was admitted to the Association of Southeast Asian Nations. 1. 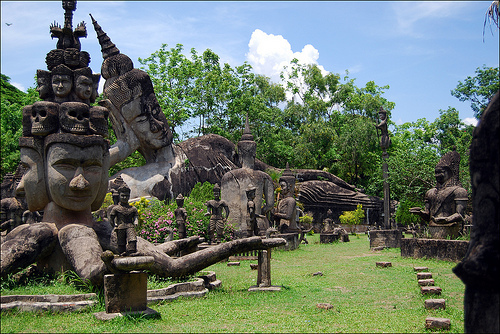 Khone Phapheng — this is one of the most popular destinations in Laos. 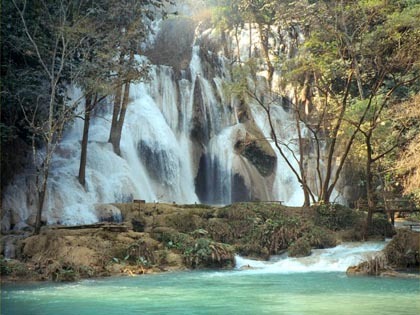 Khone Phapheng is the largest waterfall in Asia. There is also the Pha That Laung, a monument that looks like a missile from afar, but on closer look, is a tall building with several small windows. During November, a special festival is held there. 2. Luang Prabang— this is the center of tourism in Laos. It is a city of magical surroundings, buildings and natural sceneries that has remained in spite of the wars and revolutions. In fact, this place has been considered by the UNESCO as a World Heritage Site. 3. Plain of Jars— this is believed to have stood for over 2,000 years. This is where huge jars can be found from mysterious origins. They come in several shapes, designs and sizes. Jars weigh about 6.6 pounds each, and are believed to have been made for burial purposes. 4. Ho Chi Minh Trail— this place played a significant role during two previous wars—the Vietnam War and the war against the French during the 50’s. Although Laos is not known for an enjoyable and exciting night life, there are activities that people can do during the night. There are some interesting places that they can visit like beer gardens near the river. Since it is still a communist country, most establishments close at 11 in the evening. The best thing to do is to experience the beauty of the sunset instead. This can be enjoyable for lovers, honeymooners, friends and families. It is also at this time that travelers get to meet travelers from other places. Since Laos is landlocked with its neighboring countries nearby, the people have been influenced by several countries such as Thailand and Cambodia. Its music, art, literature and language are a mixture of different cultures. For instance, the language of Thailand and Laos may seem similar to the untrained ear—some people do not even hear a difference. Many Lao people understand and speak the Thai language. The beliefs are also similar, although there are some significant differences. Laotians have several different folk arts, such as ivory carving, basket making, weaving, and gold and silver work.